When designing questionnaires, we often need to decide whether to use an open or closed-ended question to get specific information. Yet we need to be aware of the fact that open and closed-ended questions each have their own strengths and weaknesses and perform in different ways. A few points are in order. 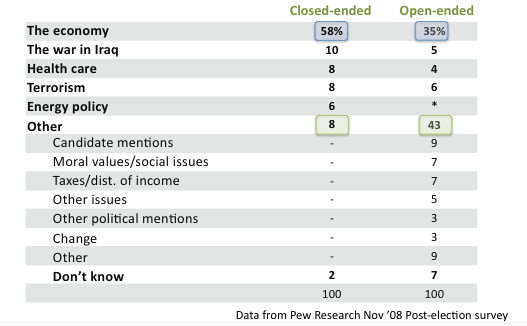 One, the open and closed-ended formats are different tasks for respondents. In the open-ended task, respondents write down what is readily available in their minds, whereas in the closed-ended task we have respondents focus their “attention on specific responses chosen by the investigator,” (Converse and Presser, 1986). Two, asking the same question in these two different formats will almost always produce different results. Many investigators have demonstrated this over several decades. Three, few respondents are going to select the “Other” category and write in responses that are different than the answer choices that are listed. So what does this mean for us? If you can, do qualitative research first and make sure your closed-ended questions represent the items that are in people’s heads. We need for the list of items to be complete since few respondents will select the “Other” category. It may also be necessary to list items that are not readily available to respondents if those items are important to you. I will discuss this further in my next blog post. Consider doing split sample studies where half of the respondents see the question in the open-ended format, while the other half sees the question in the closed-ended format. When presenting results, I have found it helpful to explain to the audience, in a sentence or two, the fundamental differences between open and closed-ended questions. This helps them understand that these are not necessarily precise measurements, but measurements that require some interpretation relative to other questions in the survey and other information from qualitative research. Hence, that is why they need an analyst like you or me! The differences in the performance and appropriate use of open and closed-ended questions are an enormous topic. I will follow up with more discussion in my next few blog posts. * Converse, Jean M., and Stanley Presser. 1986. Survey Questions: Handcrafting the Standardized Questionnaire, Beverly Hills, CA: Sage.